Vels Pinewood Holiday Inn situated near Ooty Lake is nestled amidst the lovely pine trees over-looking the meadows, offers a unique experience of the 'Queen of Hills' Vels Pinewood Holiday Inn is a French type Bungalow with a spectacular view. Vels Pinewood offers 3 Suite rooms, with a living and dining room all of which are well designed and decorated with high- class elegant furniture to suit the requirements of the guest. The lovely lawn in front of the Bungalow would be the ideal place for one sit up and sip your morning coffee. The Bon fire place is an added attraction. Room Service, Backup Generator, Front Desk, Airport Transportation, Internet/Wi-Fi. Television Room, H/C Water, Attached Bathroom, Ceiling Fan, Air Conditioning Room. 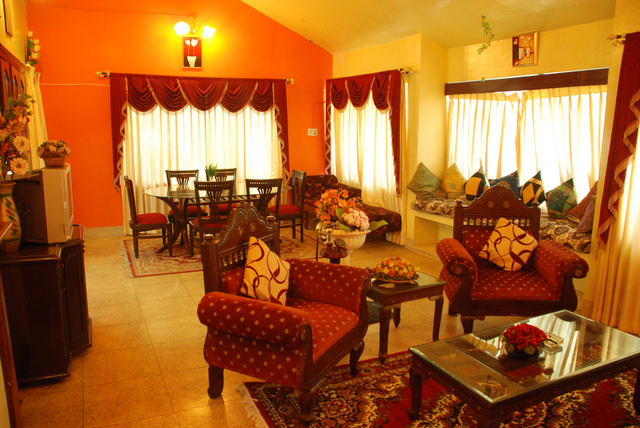 User reviews for "Vels Pinewood Holiday Inn Ooty"